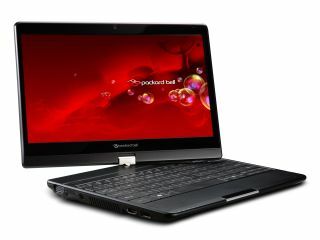 Packard Bell has unveiled its new high end laptop, the EasyNote Butterfly Touch Edition, complete with swivelling screen and multi-touch. Perfect for the indecisive, the notebook offers an 11.6-inch screen with a weight of under 1.6kg, a full-size keyboard and up to eight hours of battery life. But if typing sitting at a desk is a bore for you, simply swivel the screen and turn it into a tablet PC, complete with multi-touch, for commuter-jealousy-baiting multi-touch. It's running Windows 7, can sense when in portrait and landscape modes (and resize to fit too) and has a HD screen with 1366 x 768 resolution. It also packs optional 3G module, webcam, Bluetooth, 4GB RAM, Wi-Fi, HDMI, 5-in-1 card reader and although PB is stating a '640MB hard drive' we think you can safely assume that's actually 640GB, otherwise this would be very 'retro' in spec. Coming in February next year, it will set you back around £500, or 27,000 TechRadarPebbles if we can get our new currency ratified by the EU by then.